I was sitting in the backseat of an Audi E Tron electric sport utility vehicle. I couldn’t hear the engine, partly because it doesn’t make a sound but also because I was wearing an Oculus Rift headset. In front of me, an asteroid belt was slowly moving into view. This proof of concept, called the Audio Virtual Reality Experience (also referred to as Audi XR), is in partnership with Disney and Marvel Studios. So, as you can imagine, the VR game in the Audi had to do with Iron Man, saving the universe, and shooting stuff. It’s amazing. I’ve never quite experienced something like this. 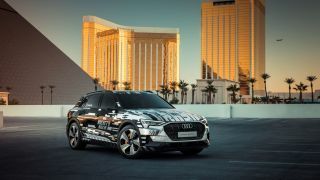 To give you an idea: The test took place at the Speedvegas track in Las Vegas during CES 2019. The driver was trained to speed up, slow down, take corners, and maneuver in a way that matched the action in the game. It’s brilliant because you feel exactly like you're on one of those VR rides where you move around to match what is happening on the screen, and yet this VR works on a SUV. The idea is to entertain the kids (or the adults) in the backseat. One example might be to show a VR film for the surrounding area as you drive, pointing out points of interest or describing the history of the area. One rep suggested a trip between Vegas and LA where the car is turned into a stagecoach somehow and educates the kids about the history of the area. I pictured this type of car entertainment happening at night when you can’t see anything out the window anyway, or for augmenting a trip for short periods. It doesn’t make as much sense driving through a place like Colorado or Yosemite National Park during the day, choosing to go into a VR mode instead of watching the scenery unfold. Yet, what is really impressive about how this all worked is that you don’t feel nauseous at all. The movement in the VR game matches the movement in the car, so your brain and body sense the movement as it occurs. This isn't true in most VR games. The phenomena known as VR Legs is a legitimate problem (I’ve experienced it several times myself). You feel transported in the VR and it’s awesome, but then after 30 minutes or so you lose your sense of place. Another demo from a company called MIxCast at CES called Richie’s Plank Experience has a similar effect. It only lasts a few minutes, and you’re standing on a piece of carpet at a convention center, but afterwards you swear you were walking on a plant and flying around with jet packs. In the future, cars will become entertainment centers even more as they start to driving autonomously even more, and we sit and have a sandwich in the backseat. The entire concept of a car will change, becoming larger, wider, taller – something that is meant purely for transport with AI that watches for traffic problems, handles all of the steering, communicates with other cars, and does all of the hard work as we watch a movie and relax. Are we ready for that? Is the tech ready? Not quite. However, this Audi demo does reveal a little of how we will benefit from automotive advancements in the near future.